If you are not a hunter, pheasant can be a hard poultry to come by because it is not sold in your average supermarket. If you search around for specialty meat stores or butcher shops you should be able to find this delicacy bird. You will pay a premium but these recipes will make it worth every penny. Pheasant is a lean poultry meat that needs to be handled with care when smoking because it tends to dry out during the long smoking process. It can be a rare treat if you follow the recipe directions step by step to help lock in the moisture of the bird. 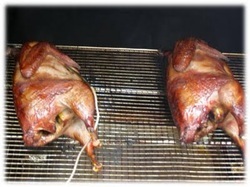 Smoked Pheasant - Smoking pheasant is a surprisingly delicious way to prepare this delicacy poultry. Since pheasant is such a seasonal dish that you may not make often, this recipe will give you the smoking tips you need to cook it right the first time.